More business and residential developments, along with improved public safety protections, will soon be coming to estimated combined total of 60,000 city and Hidalgo County residents as a result of recent decisions by elected leaders to invest more than $1.6 million for Edinburg Fire Station No. 5, the Edinburg Economic Development Corporation has announced. Edinburg Fire Station No. 5 is being built on at 8502 N. Jasman Road in the northern part of the city. 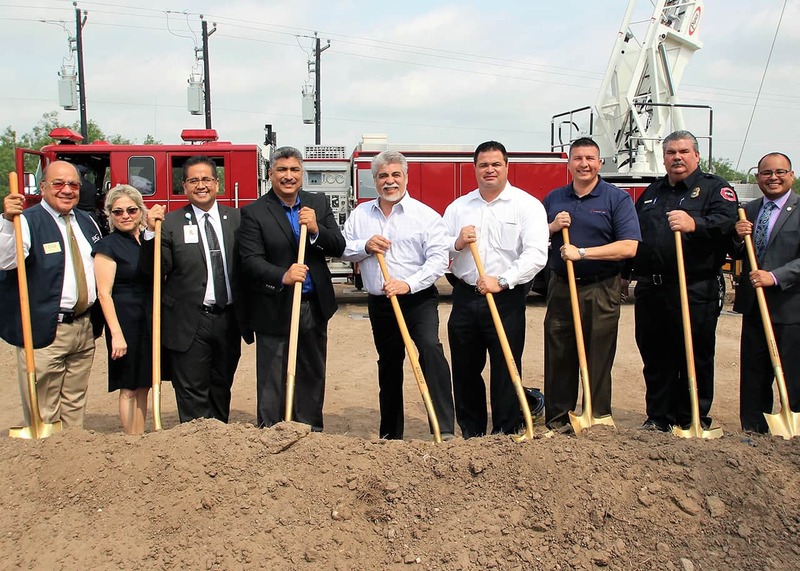 On Wednesday, May 10, 2017, Mayor Richard García, along with Councilmember Richard Molina, Councilmember Homer Jasso, Jr., Councilmember David Torres, and Fire Chief Shawn Snider participated in a groundbreaking ceremony for the 9,571-square foot facility – which also will house emergency medical services (EMS ambulance) – that is set to open around the spring of 2018. Edinburg’s Solid Waste Department donated the site for the use of Edinburg Fire Station No. 5. The City of Edinburg is investing more than $1.15 million, while Hidalgo County Emergency Services District No. 3 is contributing $500,000. The combined funds are only for construction. The complex, being constructed by Candela Organization, LLC, will be the first fire station in the northern part of the city. Edinburg Fire Station No. 5 will be a full service station with four fire trucks and one ambulance, and will be equipped with dormitories, a kitchen, and a workout area to house up to 10 firefighters and two ambulance attendants. Letty González, President, Edinburg Chamber of Commerce, agreed with the Edinburg EDC Executive Director regarding the positive influence that will be felt for the region and the city with the Edinburg Fire Department’s upcoming presence in north Edinburg. The location of Edinburg Fire Station No. 5 will allow a faster response time to any emergency that may present itself in north Edinburg, said Edinburg Fire Chief Shawn Snider. But the positive economic effects, along several key levels, also will result, he added. Fire insurance premiums for residences and businesses “are a critical issue,” Snider emphasized. Snider illustrated how those fire insurance premium savings should take place for people when Edinburg Fire Station No. 5 is built,staffed, equipped, and open for business. The fire chief advised owners of the thousands of people who soon will be served by Edinburg Fire Station No. 5 to contact their respective insurance carriers to take advantage of the lower insurance premiums for which they should qualify. The fire chief noted that some of the city government’s major assets, as well as big private investments, will also benefit from the new fire station. Dozens of other major residential, commercial, and governmental segments of north Edinburg and its economy will soon be falling under the more immediate – both in time and in distance – protection of the Edinburg Fire Station No. 5, including almost a dozen public schools, the North Industrial Park, and the 726-acre La Sienna Master Planned Community and Resaca Market. Although Edinburg Fire Station No. 5 is being built within the city limits, because of its contract with Hidalgo County Emergency Services District No. 3, it also will serve non-residents of the city. The fire chief said Edinburg Fire Station No. 5 will prove its worth in many ways, including “faster response time to able to show our citizens. Fort Oglethorpe Fire & Rescue, which serves northwest Georgia, provides independent but related insights into those and other insights brought out by the Edinburg fire chief. “Homeowner and business insurance companies use many factors when determining the cost of premiums. One major factor is the level of fire protection. Most insurance carriers use what is known as ISO to determine the quality of fire protection available and therefore establish insurance rates. “ISO stands for Insurance Service Organization. This is a group of trained, professional evaluators that assess almost every fire department in the U.S. ISO uses a consistent set of guidelines to evaluate a fire department. “ISO bases a fire department’s rating on many factors including the number of personnel on duty, training level of personnel (paid or volunteer), the amount of water the fire department can get to a fire, and the amount and quality of equipment used (such as fire engines and hand tools). The purpose of ISO is to give insurance companies a uniform system on which to base their insurance premiums. “For an insurance company knowing the capabilities of a fire department is important. The better the fire department, the better protected a building is from fire damage and loss. The higher the level of protection, the less likely an insurance company will have to reimburse a claim for fire damage. The fewer number of claims, the lower the cost for the insurance provider. “Of course fire protection can work the opposite way. A sub-par fire department will experience more fire losses. More fire losses means more insurance claims filed. In order to make costs meet, the insurance companies raise the premiums you pay. The fire station, which is being built, is on Farm-to-Market Road 2812 and Jasman Road, on the northeast corner. That property is owned by the city’s Solid Waste Department, which donated the site for the use of the fire station. The building and its improvements are being funded by the city’s General Fund. The City of Edinburg is investing more than $1.1 million, while Hidalgo County Emergency Services District No. 3, which covers the rural area north and east of Edinburg, is contributing $500,000, for a combined total of more than $1.6 million for Edinburg Fire Station No. 5. These combined funds are only for construction. The City of Edinburg still will have to pay to staff the station, the fire equipment, the fire trucks, and everything related to inside of the facility. To staff three shifts of one truck company there will run around half a million dollars a year. If we have to put a truck there, that would be another $700,000, but right now, our plans are to use the trucks we have. The same is true for the personnel – once that station is finished, we will take some of our paid staff and have them at the station. Anything else the city can provide would be a blessing for that station. When you put a station there, in addition to equipping and placing personnel – both paid and volunteer staff. We have volunteer firefighters who live in that area already, and they will work out of the new station. But currently, they have to come to the existing fire stations. When the new fire station is finished, we will assign some of our paid staff to it. The fire station will be able to sleep 12 people. As part of the agreement with the Hidalgo County Emergency Services District No. 3, we will be able to put an ambulance there, and the two people assigned to that ambulance will be able to stay at the station. So, there will be 10 people who can live there, and there will probably be around 20 total people, mostly volunteers, who service that station during all the shifts. The fire station is in the city limits. We have the rural fire response area, which goes all the way to Valverde Road eastbound, and all the way to Farm-to-Market Road 490 on the north side, plus we go to Wallace Road on the west side. The City of Edinburg has a fire contract with Hidalgo County to provide emergency services, with the exception of ambulance, to the rural citizens of Hidalgo County within our jurisdiction. We have our area we cover, just like the other cities in Hidalgo County have in their jurisdiction rural area. In that area to be served, we have the city’s regional landfill that services not only Edinburg, but also about 80 to 90 percent of the Rio Grande Valley. We have a gasoline storage facility plant, near Ingle Road and U.S. Expressway 281, that services more than 90 percent of the fuel that is going into gas stations here in Hidalgo County. We have three major truck stops and we have the city airport for which we need to provide services. We have the residences. All that area 20 years ago was farmland, but now we have rooftops. We have replaced tree tops with roof tops. There are so many single family homes in that area, along with businesses running along FM 2812 and also northbound and southbound Expressway 281. Fire insurance premiums for residences and businesses are a critical issue. If you look up the insurance ratings, and for example, you go to Ramseyer Road and U.S. Expressway 281, on one side of the road it will be a 3AB rating that the city of Edinburg has, and on the other side of that road, it will be a 9 rating, the second-worst rating you can have – no fire department available. We only get credit for five road miles from the closest fire station. The closest station to that region that will served by the new fire station is Station 3, which is on State Highway 107. Five miles north of Station 3, the insurance credit we have for all of our trucks, people, training, prevention, everything we do stops right there. The people on the other side of that five mile radius do not receive that benefit for insurance credit. Placing that station of Farm-to-Market Road 2812 and Jasman automatically drops a diamond-shape balloon over that part of the city, and gives everyone that improved rating immediately, and significant savings on insurance premiums. I have an example from a number of years ago. A mobile home owner whose residence was within the protection radius of a fire station paid around $1,000 a year for their fire insurance. But that same home owner, if their residence was outside the protection of the fire station, would pay $2,500 a year. Those are old rates, which were less expensive back then. I am hoping that all these people – homeowners and business owners – who come within the protection of the new fire station will file the paperwork that will allow them to receive the credit to their fire insurance premium. Right now, they are receiving a Class 9 rating, which is second-to-the last rating, just because they are located five miles or further away from any fire station. This new fire station has been in the plans for several years, with us working with the Hidalgo County Emergency Services District No. 3 to receive the additional funding. It took about five years to get that agreement developed. The project already has been put out for bids and awarded. There already has been a ground breaking. The benefit of this new fire station is that we will have a faster response time to able to show our citizens. We are reducing the mileage needed to get out there. It will take 10 miles off the response from our current fire stations to get out there. The response times will improve tremendously for both the rural area and the portion of the city to be served by this new station. The possibility of being able to save a life also increases, as well as improving the odds of saving property. Just by saving 10 miles off the time to respond from our current stations to that area will have a beneficial impact, not only for homeowners, but also for business owners who want to set up shop there.